Some of you might remember Tavis Rogers' incredible elk hunting story that we shared before the beginning of elk season. 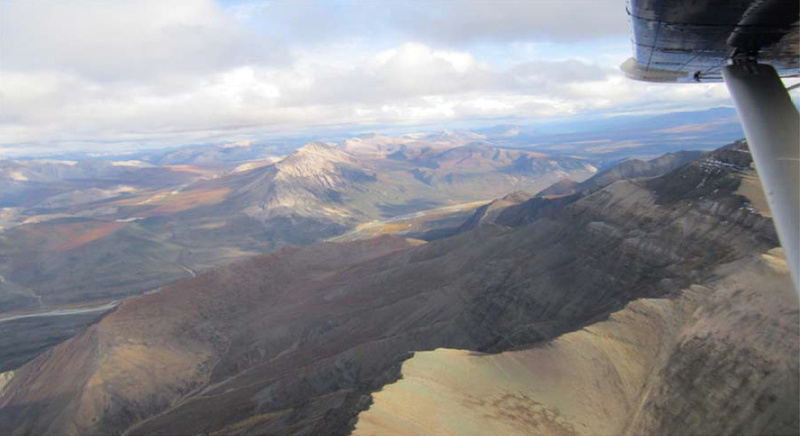 Well Tavis just returned from the NWT chasing dall sheep and caribou, and what an adventure he had! Tavis was generous enough to write down his experience so that we could share it with our readers. The majority of us can only dream of this type of experience. Here is Tavis in his own words, enjoy. The ride in the Otter from Norman Wells to the lodge took about an hour, going over some incredible country! There were three other hunters on the trip in, and all were on at least their 3rd trip with Gana River Outfitters. Charles Eddy and his wife were up for their 13th year in a row. 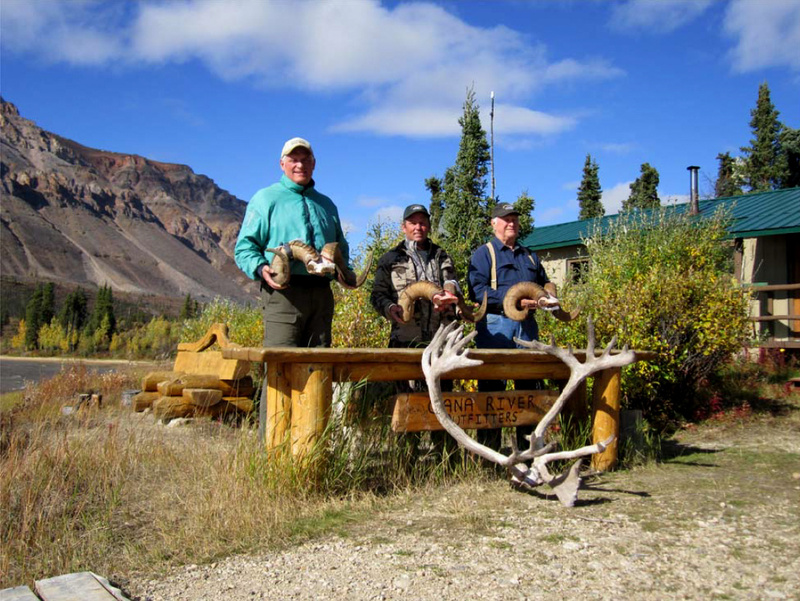 At 82 years old, Charles said he was too old for sheep and only after caribou on this trip - he had taken a bull over 400" last year above the lodge and was looking for one bigger! 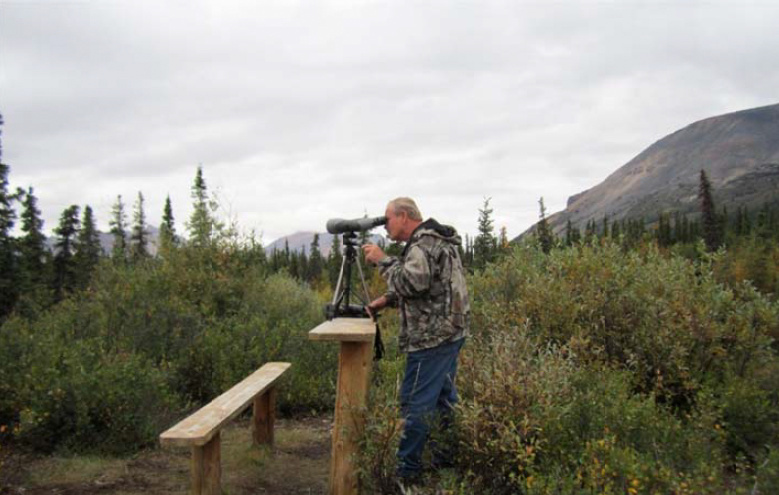 We dropped in on Palmer Lake and met the outfitter (Harold Grinde), guides, staff, some of the hunters with early success, and outgoing hunters. 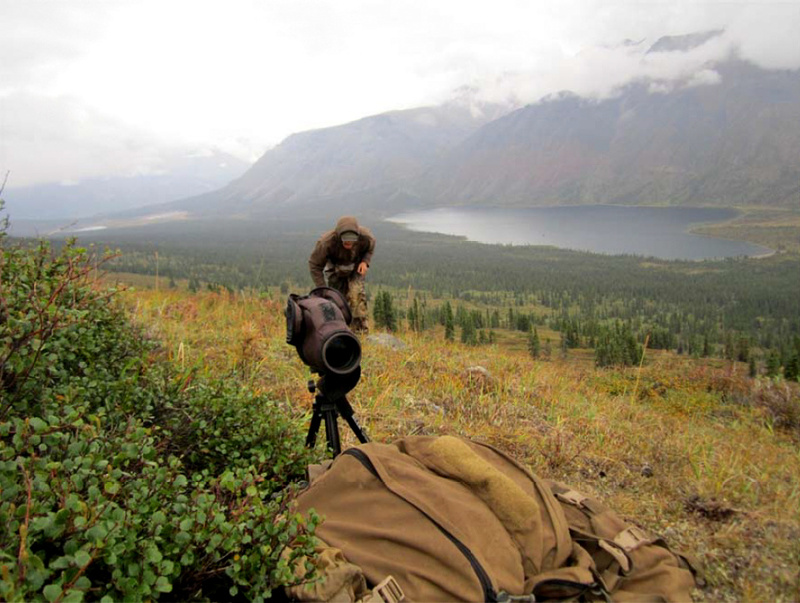 There was a spotting scope set up on a table and one of the guides said to take a look - it was a pretty nice caribou. I had just seen my first caribou bull! 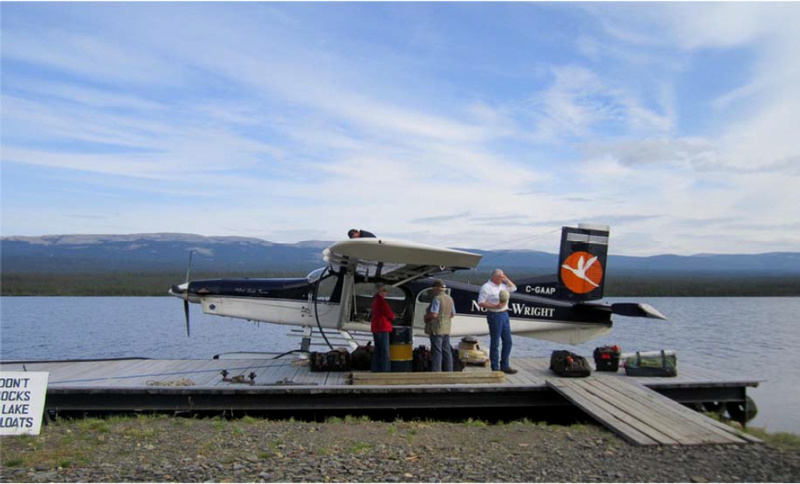 After unloading our gear and re-loading the plane with the outgoing hunter's gear, we were treated to a wonderful meal. 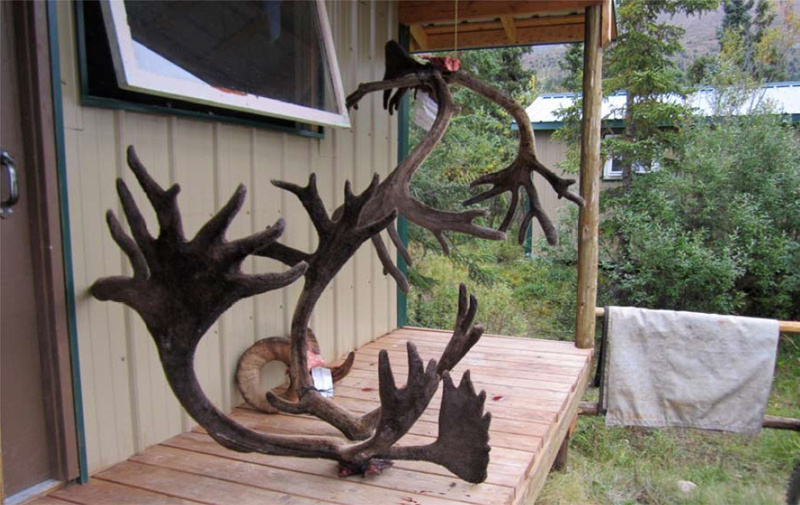 We went out and saw a couple of monster caribou bull racks at the skinning shed. Harold and some of the guides headed out back to a hill that was set up for spotting and I grabbed my bino's and scope to join them. We saw a number of caribou bulls and one impressive wide one down the creek past the lodge. My guide, Scott Kennedy, and I rode out the first morning and saw some decent caribou. We also saw the wide one that we had spotted the night before from the lodge not far out of camp. He crossed the river behind us and we paralleled him from the bottom until we saw him bed with another good bull, above timberline. The 2nd bull was very interesting with palmated tops, palmated bez, and double shovels - probably would score better, but he was really narrow and I liked the wide one. We rode the horses up underneath them and hiked up to close the distance. 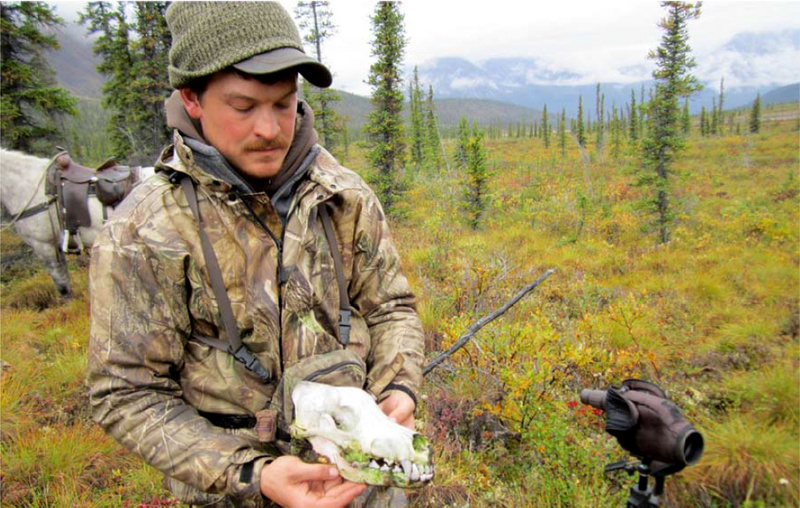 Along the way, Scott picked up a wolf skull that was lying in the tundra. When we were about 200 yards away, the other bull caught us moving and spooked a bit. They ran down the ridge and held up with a cow and a calf about a mile from where we started. Cover was limited so we dropped down and worked to close the distance on them to see if something would shake out. Along the way we bumped four cows that walked within about 10 yards of us before spooking. They ran down the hill and then looped all the way back up to where the bulls were. The bulls got up with the cows and followed them up into the clouds at the top of the mountain. They bedded down with one bull covering our direction, and the other covering the other side. We stayed put for several hours and waited for the bulls to make a mistake. The bulls stayed up there for several hours and then got up and started feeding down the hill toward us. The wind was blowing left to right, so I moved up the hill, closer to where they were coming down. When they were about 100 yards out, they changed direction and started moving to my right. I had to make a quick adjustment, so I crawled about 100 yards to my right to be in position to cut them off. The 2nd bull caught me moving at about 30 yards and stared me down for a while. I froze until he turned. I could only see their antlers since I was using a little riser as cover. I waited until it looked as if they were both feeding again. I belly crawled another 10 yards and nocked an arrow. The only way to get a shot off was to draw and raise up at the same time. As I raised up, the 2nd bull saw me from about 20 yards and started to move away. The wide bull was about 35 yards away, he raised his head and looked to see what his buddy was looking at. I hit full draw, I shot at the same moment the wide bull saw me and started to move. The arrow was on the way as the bulls took off to get out of there. The arrow hit the wide bull as he took off running down the mountain! When he got down to the trees I saw him start to wobble. In no time he rolled around the hill and out of sight. Scott ran up the hill to me and asked if I had gotten a good shot. He was more excited that I was! I told him that I was a bit worried about the shot and that the bull had jumped as I shot, but that he was wobbling as he ran out of site, and I felt that that was a good sign. We cut down the hill to cross his trail and found good blood on the ground. I cut the distance to the trees where I had last seen him and found tracks and more blood. I looked down the hill and saw my arrow sticking straight up with a large set of antlers right beside it. 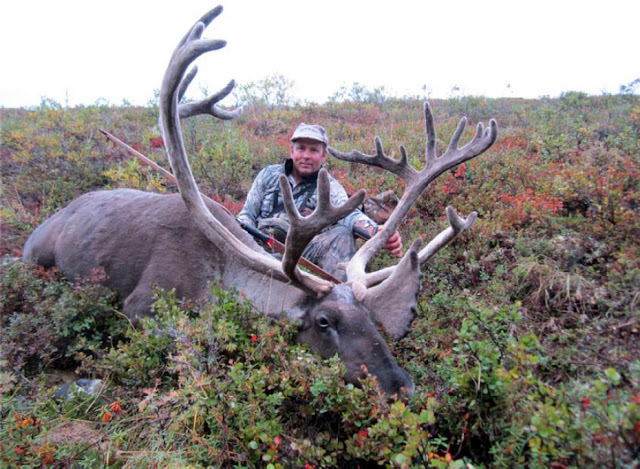 He was down - my first caribou, and he was a dandy! My first caribou on my first day of hunting! When we got back down to camp, we learned that we had been the excitement for the day with everyone keeping an eye on our progress. 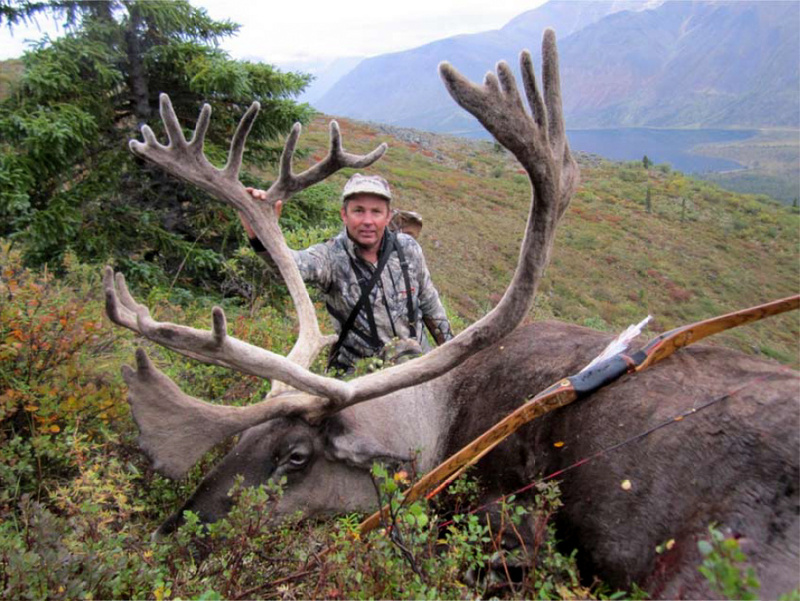 When we bumped the bulls the first time one of the guides commented that no one would ever catch up to a caribou with a bow after it had been bumped. As were working on the skinning and butchering Harold came up the hill with the horses and helped out. He said that he had seen the bull come down the hill and then tip over with an arrow sticking out of him. When I popped out right there at the bull Harold figured he better get his pack and come to help us out. At supper that night someone mentioned that they hadn't heard any shots, and Scotty commented that they must have missed the twang of the bowstring! With that out of the way, I was amped up for sheep! We trailed into camp on the second day with 3 hunters, 2 guides, a cook, and a wrangler on a string of 17 horses. We set up camp and got settled in. 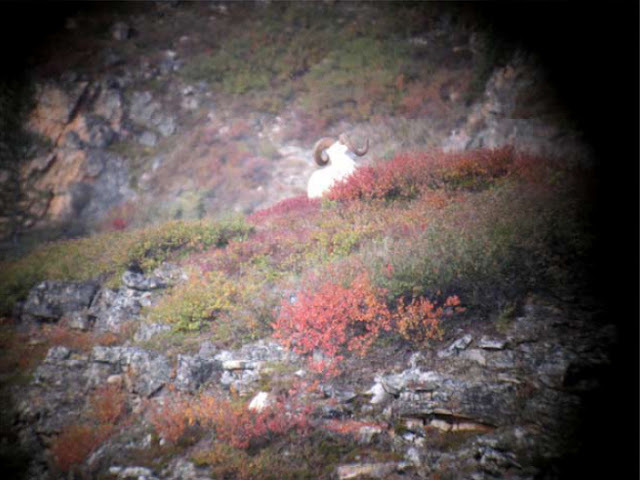 We glassed a little around camp and saw some Dall's Sheep rams on both sides of the valley around camp. There were 6 rams behind camp and another couple on the other side. We set up the scopes just outside the cook tent and enjoyed the evening. The next day, I was paired up with one of the other hunters who was after a caribou. 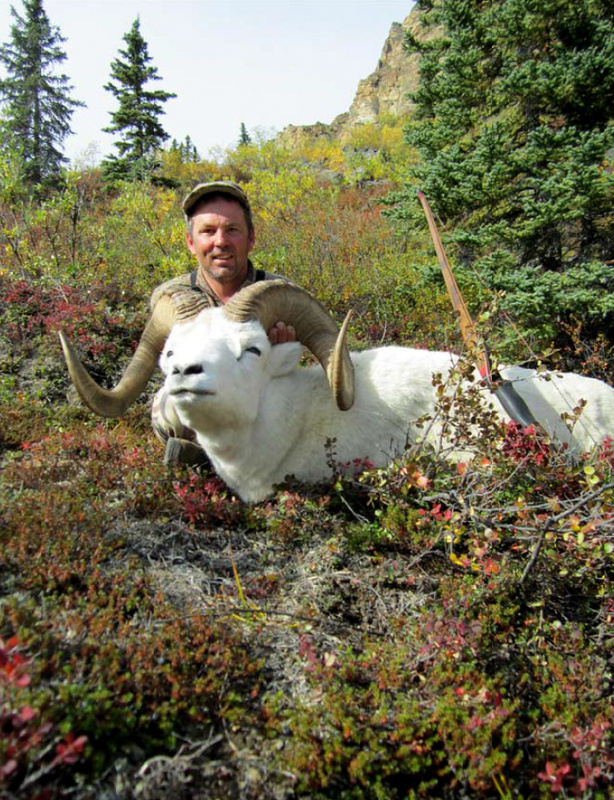 This was Garry's second trip with Gana and he had taken a great caribou and a Dall's ram his first time around. We saddled up early and rode up into one of the side valleys. 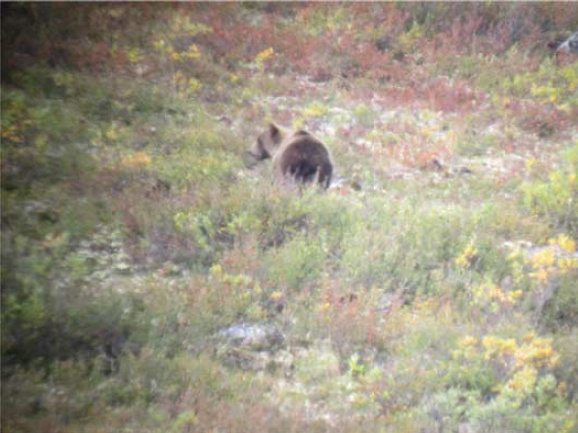 We saw quite a few caribou, ewes, lambs, one really nice ram and a chubby grizzly bear vacuuming up berries. Scott said that the bear was named Gus. He said Gus was pretty tame - even a hunter could ride him. After eating berries up to a nice place in the sun Gus laid down for a nap. I just couldn't convince Scott to go over and saddle him up for the ride! Late in the evening, we spotted a real nice bull and Garry decided to take him with his rifle. 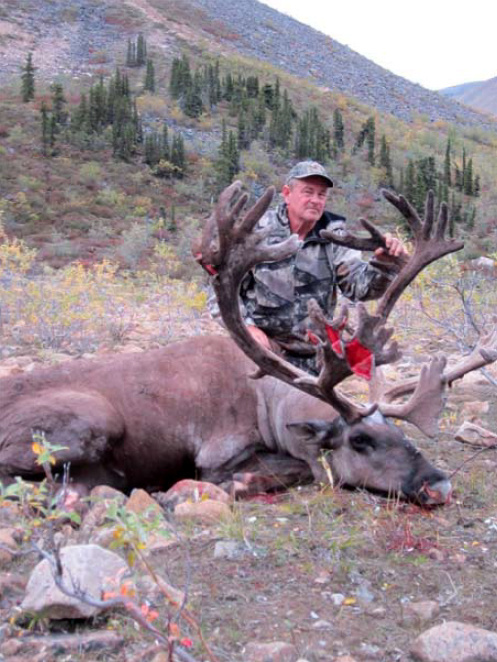 The next day was spent in camp caping out Garry's caribou. I was a bit antsy, so I practiced, went around camp shooting ground squirrels with my bow and built the cook a slingshot. With a little practice she was hitting pretty close to what she was aiming at. I was pretty sure that the wrangler and a couple of the guides were going to have to start minding their manners a bit better. Garry decided to pack up and go back to Palmer Lake with his caribou. 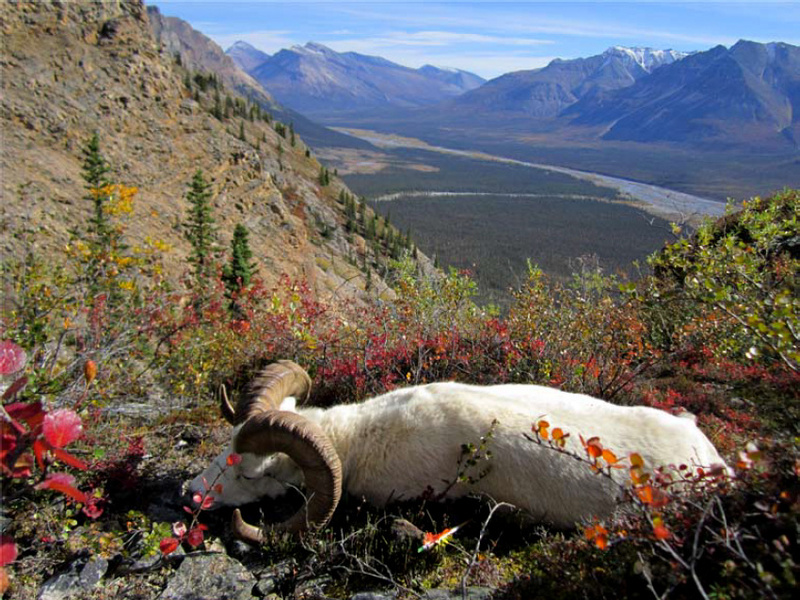 My first day of sheep hunting (5th day of my hunt) we rode out of camp and down river. We found a group of four rams with three of them being over full curl. We dropped down and found a place to cross the creek and climbed up to see if we could get close enough to make something happen. The rams fed up into a high hanging bowl where they could see in all directions. They stayed there until dark. We backed out carefully and hoped to come back the next day to get a better angle on them. It started raining that evening, Terry (the other hunter) and his guide Jason didn't make it back into camp. We stayed up late, but figured they had killed something or were holed up on the mountain somewhere. The rain continued all night and through the next day, with snow and cloud line dropping down to the top of the trees. There was no point in getting out and getting soaked all day so we holed up around camp. Terry and Jason showed up around lunch time with a very nice ram. I got on a nice, old, broomed ram on my second day of sheep hunting (7th day of my hunt), but could not close the distance for a shot. The horses decided to head up river on the 8th day, so we had to backpack hunt from camp until they could round them up. This was my 3rd day of actual sheep hunting and I was a bit frustrated with all the lost days! Luckily, there was still a nice ram running around in the cliffs behind camp. That morning we saw him travel out of an avalanche chute and bed on a low rock outcrop. When my guide and I got to the chute where the rams had been feeding I saw a high saddle behind a pinnacle of rocks. It looked to be a likely spot for the sheep to come through, and possibly a great spot to set up an ambush. We climbed up and found a smaller ram bedded above the big one. There was a well-defined sheep trail going through the saddle. We found a decent spot with some brush and rocks and settled in to see if the rams would come through the pass. was gone but the bigger ram was still bedded. I started getting ready. I got one arrow on the string and laid out two beside me, just in case. With the angle of the hill and the brush, it would be very difficult to shoot sitting down, but better from my knees. The problem was that on my knees, I would be pretty exposed. The younger ram started up the trail and came over the pass like he was on a string. We could not see the bigger one, but figured he would follow the same trail. I started to get nervous because I knew that the young ram was fixing to get our scent and we had still not seen the big ram. The smaller ram stopped in the trail when he got downwind and started looking around on full alert. Then he turned and bounded away like a rabbit, back over the pass and up into some big cliffs several hundred yards away. Scott and I raised up and watched him bound away. We pretty much figured we had blown it. I noticed that the young ram was still looking at a spot behind us and told my guide to duck back down because we might get lucky and have that big one come over. We kept an eye on the smaller ram through the bushes and waited. Pretty soon I heard some rocks clatter behind us. I looked at Scott and told him to keep down. Then, I could see some white through the bushes coming up the trail. It was the big one! He cautiously slipped through the pass stopping every few steps to look all around for what had spooked his buddy. It was pretty nerve racking to have him that close and not have a decent shot through the rocks and brush. He finally made it over the top and into the clear where I had a shot. He turned to look up the hill at his buddy and I drew from my sitting position. My bow was in the brush and the angle of the hill was wrong so I canted my bow horizontal and shot. 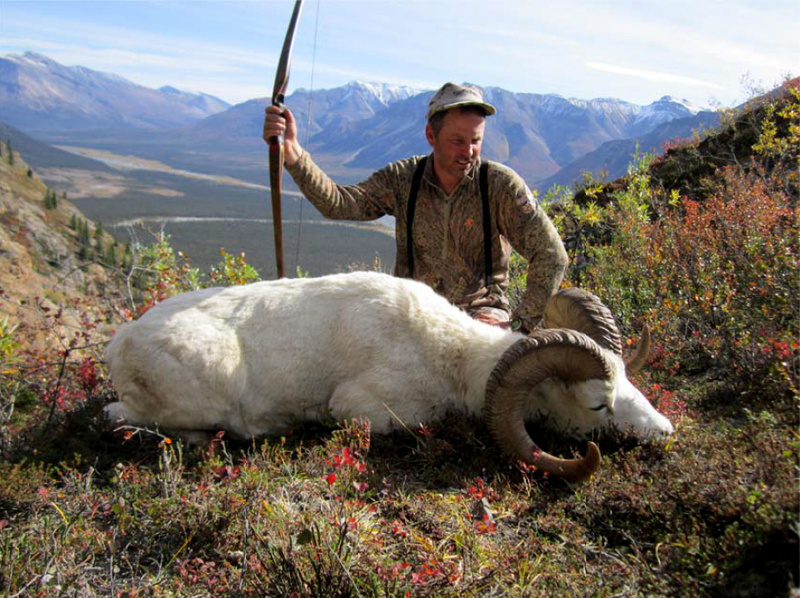 My lower limb hit the tundra and that arrow wobbled and fluttered down toward the ram and stuck in the trail between his feet. He jumped off the trail and then turned to see what the heck landed between his feet! I had another arrow on my string without thinking and I was on my knees for a second attempt. My second shot, from my knees, hit him about two inches behind the shoulder, he ran hard back over the saddle and around the other side. My guide started whooping it up pretty hard and said "you smoked him!" I was concerned about the angle as he was quartered to me at the shot. The ram ran across some really nasty rock slides and back to where he had bedded earlier in the day. We watched him for a while and then tried to figure out how to get across to his side. There was no way to get around so we had to hike back to the bottom to try and get up from another direction to where he was. By the time we were at the bottom it was getting dark, so we decided to hike back to camp and leave him until morning. Needless to say, it was a very, very long night. Wolves had killed a caribou in the river about ½ mile up from the camp, and we were seeing plenty of grizzly bears and their sign all around. The next morning the horses were even further away. Quite a round-up ensued, involving airplanes to find them. My guide and I waited for a while, then told them to leave us 3 horses when they found them, and that we would catch up to them at the next camp with the ram. We hiked up and found a way into the cliffs, about a half mile from where we had last seen the ram. We slipped along like we were stalking a healthy ram, just in case. We got to the pocket where we had last seen him, and there he was, lying under a pine tree. I snuck down and put another arrow in him, to be sure, but it wasn't necessary. He was done. 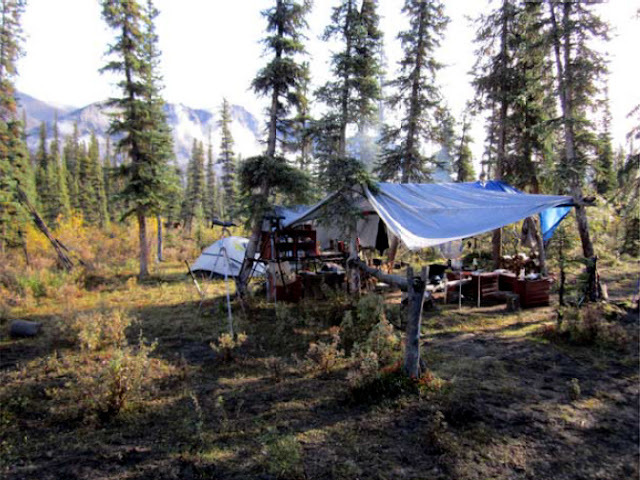 After pictures, skinning, butchering and packing up, we started back toward camp. Actually beat the horses into camp by 7 hours. We got a ride back to base camp at Palmer Lake in the Super Cub. Wow, amazing how much faster you can get around the country in a place than on foot or horseback!! One of the sheep hunters had an old injury and had to return home, so the outfitter sent Charles out for a ram. He got a great old broomed off ram at the young sheep hunting age of 82! Terry, Tavis and Charles - Awesome hunt!